For the moment, HTC has to wait around for US Customs to decide what the next step is with the hardware. Until then, AT&T is running low on stock of the One X (out of stock on their website already) and the EVO 4G LTE may not make its planned May 18th launch date on Sprint. For now, we haven’t heard any trouble with HTC One S inventory and whether T-Mobile already has enough units inside the US to fill short-term needs. HTC will try to stay the ban while it appeals the case, but for the moment US Customs is in possession of HTC inventory. Things could get very interesting indeed. ← Google To Release Nexus Devices From Multiple Vendors, Sell Through Google Play Store? Wheres the popcorn? and of course i want to see HTC come out on top of all this, most likely the ruling will be overturned and apple will have to pay a fine in the amount of how much profit was lost due to it and the value of the One X goes up in the states due to the unavailability and controversy that has been presented. HTC will win. Nope… That wont happen. The lawyers created the phone. Samsung was cautious creating the phone this time. Wow, good job Apple. You might as well try to trademark everything smartphone related. On a similar note, why is nobody going after Apple’s use of the drop down menu? The Beatles have been working on that for years. Cause Apple claims they had it first and Android stole it from them.. In fact, they claim that the entire Android system is based off Apple which is funny seeing as Android is run off the Linux system. Next in line for a lawsuit will be the Washington State Apple Commission. People should feel lucky they don’t have to deal with the issues this HTC One X has. So disappointed. III HATEEEE FFF DICTATOR APPLEEE what is it that they want no competition? no choices ?? whoever wants their crappy evil phone has the right to have it. aren’t they happy with that? Believe me if there were no HTC or SAMSUNG we would still running an iPhone 2G at its best. Apple must stop and concentrate in not falling behind. I am so pissed right now we should all prepare a protest for tomorrow at their headquarters and have all the press exposing this hate. apple is a disgrace to the mobile world.. this is the reason why i dislike apple, i don’t hate their products, but this is mainly the reason why i loathe the company.. I agree friend… great products but I dont own ANY of them for a reason. The downside to that is people keep buying those phones and not demanding more. Stop buying them and maybe Apple will get the message. Just another reason why I dislike Apple. They seem afraid of competition because they feel cheated by other companies. While it might be true that others use similar ideas and improve upon them Apple is no better since they rip other companies off by charging them a fortune just to carry their product… the iphone. It’s like they want it all or not at all. Greedy a$$ company. You don’t mention hating Microsoft who owns patents that Android infringes on and as a result, every Android device sold has a $10-$20 tax paid to Microsoft. I thought MIcrosoft was already universally hated? Did I miss something??? What is this about a Sprint LTE Device???? It’s the HTC Evo 4g LTE. I’ll bet it’s the lock screen…. I knew there had to be a reason why I never wanted an iPhone, smh. I need to get rid of this thing…Apple seriously disgusts me. Great products, but I’m not gonna support a company who thinks they run the mobile world as a whole. It seems to me that Apple will do anything to stifle competition. What a disgusting, arrogant company. They need to realize that there are other companies out there who contribute to the mobile consumers. It seems as if other companies have to abide by THEIR (Apple) rules. There’s only so many ways you can transition between apps; either left to right, or up & down. Apple needs to lay off their high horse a bit. I can already see this happening. Eventually (and this is bound to happen), a fed up manufacturer will sue Apple. Apple will say that they invented lawsuits and will sue the offending company for patent infringement. What a bunch of morons on this site! HTC infringes, loses the lawsuit and now customs is holding the phones. Wtf is Apple doing here? Standing at the docks with guns? HTC is to blame for copying and you guys want to give them a pass? 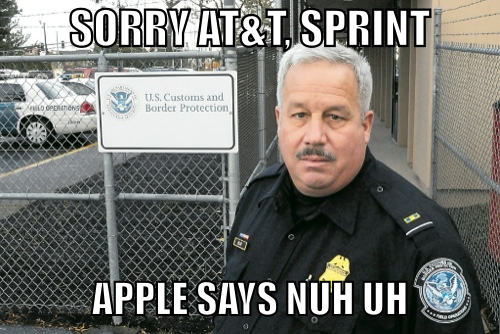 Customs is doing their job – HTC should have done theirs too. It’s a bit deeper than that. Apple has a long history of asinine lawsuits. The fact that you would sue over something as trivial as a lock screen is absurd. Imagine if everyone did what Apple does. We would all be driving the same brand of car, drinking the same brand of coffee, watching the same brand of TV, etc. So, let the people vent. It IS Apple’s fault. No, it’s NOT. I don’t know how simple this gets. HTC was found to be infringing. They were ordered to stop, or face consequences. They haven’t stopped. So now they face consequences. Quit blaming Apple for HTC’s own idiocracy. The ball is in HTC’s court. They have to prove that they’ve stopped infringing on the indicated items. HTC is the one with the power to end this problem. apple suing HTC for a lockscreen is like one car company suing the next because both cars use door handles. That’s great. The point is, quit focusing on WHY the lawsuit happened. Focus on the results — HTC found to be infringing. That’s HTC’s problem at that point. Blame Apple all you want, but HTC is the one that has the power to end this. Focusing on the results is pointless if Apple loves to sue everyone. The result can always be the same. Are you still gonna tell everyone to look at the results when there is one company ruining it for everyone else? Welcome to the American Justice System. Until HTC can prove they’re NOT infringing, their stuff will be blocked. That’s just how things work. Life’s not fair….get over it. And for FYI, I’m not a big Apple fan. I have a MBP laptop, but refuse to buy any other products, especially iOS products. I think that the reason why Apple hasn’t directly sued Google yet is because they don’t want to awaken the sleeping giant. Bet Apple is getting ready to sue the Apple fruit? Next thing you know iSheep is going to defend them by saying quit focusing on the lawsuit focus on the results of the fruit infringing…. Actually HTC has actually removed the stupid patent feature via software update for its current as well as new android phones (OneX). So somebody from the ITC who has Apple stock or is a Apple fanboy is the one holding the shipments. Basically it is bureaucracy/red-tapism at its finest. HTC admitted this was a trivial thing and KNEW that customs would be inspecting their devices for this at import. Yet they want to import less than a week before launch, and YOU want to blame Apple? Idiot. Please see HTC’s response to the situation: “We believe we are in compliance with the ruling and HTC is working closely with Customs to secure approval.”My point is that it didn’t have to come to this if Apple wasn’t so sue-happy. If every company that has ever patented anything decided to sue (especially for something as trivial as this), we would not have competition. We would not have choices, and we would be paying out the nose for everything we had.Please refrain from calling people “idiots”, it doesn’t help you get your point across, and lessens the impact of your arguments. And YOU sir are the biggest moron on here.So tell me how does the taste of Apple’s sack taste in your mouth?. Time to take your meds and grow up some. Another guy that just like riding on Apples bandwagon and sucking it pretty good! hopefully theres a game created, where smart phone manufacturers are represented by characters, and it will play like Smash Bros.
Is Apple even legally allowed to do this? I don’t see the issue here. Of course it’s legal, and HTC should have seen it coming. Idiots. I respect HTC for not changing anything. I think they will win in the end. I recall having a slide to unlock feature in Windows Mobile, before the iPhone existed. Why does Apple think they own this? Just another reason to despise Apple and all they stand for. Apple is a two faced company, they always claim their stuff is so innovative, like that pull-down notification system in iOS5 which was revolutionary because “no phone” had it before… well except every freaking Android G1 7 years ago. The problem is their sheep, they still pay top dollar for a device with a small screen, no 4G and old processor, and they’ll keep doing it even if is the same device with an added “S” in the name. Apple should be grateful for HTC, Samsung, etc. because they used their stuff and made it better, surpassing Apple and the forcing them to catch up and make their stuff better. And don’t give me that patent BS imagine if the 1st carpenter in the world had a patent for the first chair and refused other people using it. We wouldn’t be seating down on our nice confy chairs right now. It’s not apples fault. they are simply defending their rights of ownership of their designs. You have to admit this. It is until Google Openly Challenges Apple in the areas at which there is a direct copy ( Siri = Voice commands, Notifications drop down = Notification drop down, etc.) google has to challenge the litigation arm to get this going…. Note what’s being held, however. One X designed products. This means that it is VERY safe to say, while the One S design is way cool in all, the One S is almost a waste of opportunity for T mobile. Not shooting all the One S owners in the foot, I’m just saying why not the One X vs. S? (multiple superphones, who says you can’t have a couple, which is what would be customers are clamoring for — more choice of premium). Those two devices are too similar….Sure the same can be said about the tmo gs2 and amaze as they have the same guts, but different “shells” and UI. Looks like TMO dodged a bullet by getting the S (early)….As far as carrying more highend phones, choice is great but i dont think its absolutely necessary. Why just the One X and not our One S? Do they not use the same lock screen? T-Mobile doesn’t carry the iPhone. That’s why. Don’t matter if apple did not designed them or not. Apple legally brought the patents so by law it theirs. The judge has to follow the law. Doesn’t matter if Apple designed the patents or not. All that matters when it comes to the law is ownership of the patents. The rest is just emotions. I wonder how ATT and Sprint feel about this both being “IPhone carriers”? I’m sure they cant be thrilled, but to me its kind of ironic. yet another reason to hate Apple. HTC ONE S is a JUNK! inferior phone compared to hTC ONE X. why you guys are promoting hTC ONE S? no wonder tmobile always gets the inferior phones of same company. Enjoy your phone then, your going to lose either way it goes. I would never buy a andriod phone that doesn’t have a microsd card slot or a non-removeable battery. The battery has its plus though in the event the phone get stolen. But overall I wouldn’t get that phone and with AT&T high prices heck no ! but good luck with that ! Each of those phones is great for their intended market. If you want more, buy more. I love my One S–It’s a badass phone! Hope you can get your One X–have fun with it and AT&T! It is the same phone except for the screen and made by the same company…..and you have to pay double the price for the service on At & t. What evidence do you have to support your statement? I wouldn’t leave TMO to get the One X but yes I agree the bigger better screen would be awesome. I’ll just wait for the GS3 at this point. I <3 Apple. Sue me. Why do some ppl keep crying about tmo having the s vs the x??? Is there really that big a difference between them??? Can someone please educate me?…What makes the ATT X so much better than TMO’s S???? People here will cry about color choices if they have too. only difference between the U.S. Version of the S and X is that the X has a bigger screen. Thats what i thought!!!! So why are ppl crying about it???? The Note is coming….ppl need to calm down. When is the note coming? I have heard people keep saying it but all I get is the popular “real soon now”. Excellent piece on NPR there. Really opened my eyes.